Follow either of these procedures: o Push the RES/+ switch and hold it. Your vehicle will accelerate. Release the switch at the speed you want. o Push the RES/+ switch and release it immediately. 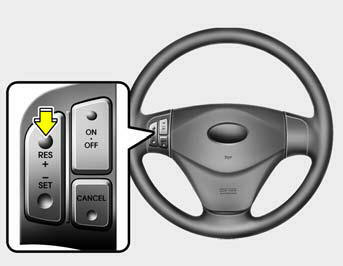 The cruising speed will increase by 1 mph (1.6 km/h) each time the RES/+ switch is operated in this manner.